Because of sharp increases in opioid overdoses, emergency doctors at Eskenazi Hospital in Indianapolis developed Project POINT to reach drug users when they are most receptive to change—soon after a near death experience. Now trained staff approach every overdose patient who has received Naloxone, a medication used to counter the effects of overdose, to talk about recovery options and establish a connection to care. Although Project POINT staff engaged hundreds of patients over two years, not every patient was ready for recovery after being approached in the emergency department. Also, the program has had a difficult time staying connected with these individuals once they leave. To address these challenges, Project POINT leaders approached Research Jam (AKA CHeP’s Patient Engagement Core [PEC]) for help with developing effective, targeted, communication strategies to increase patient connection to and maintenance in care. Research Jam planned an engagement session for former opioid users at a local community service center. To increase engagement and decrease potential stigma, Research Jam adapted a human-centered design research activity called Experience Mapping. Human-centered design research methods are distinct from conventional research methods because the tools leverage study participants’ expertise in ways that exceed standard expectations for study participation. Experience Mapping is a traditional, exploratory activity in which participants are asked to draw out their movements and interactions during a specific experience (e.g. time spent in the hospital after an overdose). An Experience Map can illuminate the holistic highs and lows people experience during an event. Research Jam developed and applied a novel twist of the traditional Experience Mapping activity—a gamified version—with the intention of creating a familiar, engaging, and highly participatory atmosphere. 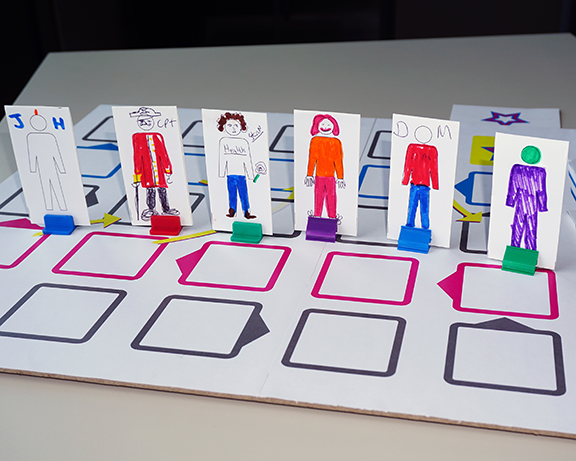 The gamified version helped to create an open, defined space for each participant to share perspectives and experiences through the disciplined facilitation offered through the turn-based format of a board game. 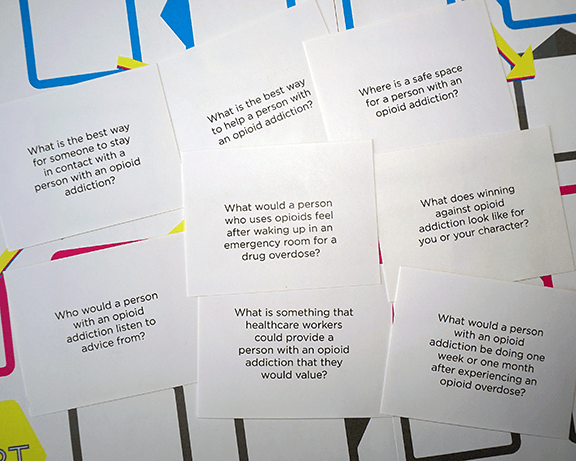 The interactive elements of party card games were utilized to create a participatory discussion between participants. During the two-hour engagement session with six participants, the game worked as planned and proved to be a successful research tool. All participants shared a wide range of anecdotes and feelings and described in detail previous experiences with overdoses, the criminal justice system, drug treatment programs, and more. Participants’ feedback on the session was entirely positive. The Research Jam team was extremely happy with the process and the depth of feelings, needs, desires, and experiences gathered. Although initially skeptical about the novel research activity, the primary investigators identified significant value in the method after the event.